The noble art of keeping is changing as it ever has, each generation adapting, creating new skills, techniques and styles. This does not mean that everything has changed completely, although some goalkeeper coaches believe they are creating some new form of mystique art, like all skills it is the philosophy and the psyche that determine the outcome. Physical preparation and drill practices enable the keeper to choose from a range of skills and deliver a result, choosing the correct skill in each circumstance separates the great goalkeepers from the good. Many of us have seen numerous keepers making great saves in practice but seemingly unable to produce on match-days. Like all sports it is the decision making that makes the difference and this will develop from the philosophy of the keeper, the coach and the team. If the keepers role in the game is seen as “to stop the opposition scoring” then he ( and his team) will always struggle to over-achieve. As stated to young keepers ” what other position on the field is there, where the opposition deliberately try and hit /flick the ball in your direction”, so what are you going to do with it when arrives- be the first move in your own teams next attack. The Positive not the negative, where are your players to pass to, where can you deflect the ball that will in % terms be more likely to be retrieved by one of your players, and does your own team know where the ball is going to rebound to. I have watched International keepers in practice, club and International matches and from the sidelines it appears that many keepers themselves do not know the options available to them they merely react -the negative .By just reacting they are not controlling the situation, in past generations this may have been described as dominating the D.
No I am not an old man who comes out with “in my day” sentiments, I have seen a number of keepers who have dominated the game at their time I just don’t see too many around to-day (perhaps I am just not watching so many games although I have watched the last four Olympics as a BBC commentator or private individual and watched a fair amount world Cup matches and English national League games). Too many keepers to-day seem to have fundamental faults or weaknesses – badly balanced, who collapse too easily and who consequently fail to dominate their own game, the D and subsequently the opposition. Who can change this the coaches not enough specialist keeper coaches, and team coaches not fully understanding how to integrate keepers into practices or drills that take a keeper and defence through 1st, 2nd and third phases. Keepers new and old have to help the coaches help themselves. And so to the next “great keeper” whoever he or she may be, one with all the physical attributes and skills of some of our current keepers but with the knowledge and presence to dominate, that decision making ability that separates them from the rest. I work in the world of Professional Rugby, by comparison “what am I rambling on about above” Dan Carter, where is the Goalkeeping Unions version of Dan. In my previous tip on logging, I talked about a corner set up for defense and touched on the positioning of the post player and the keeper. In that set up the post player is even with the keeper and to his left when the shot is taken which requires the keeper to effectively cover the three yards to the right of the post player (facing out). Most keepers are looking to get low and extend to their right when dropping to log and that presents a problem with balance for options and especially the drag flick. Drag flicks require the keeper to play in a more upright and balanced stance. No longer is goalkeeper's responsibility the three yards to the right of the post player and the height of the backboard. Now he has to cover that three yards and the height of the crossbar. You need to remember that you still have a post player and he is still responsible for shots at him. If you're area of responsibility is the right side of the goal you're not going to set up on an angle to cover the whole goal, you're going to set up slightly to the right. As I mentioned, balance is key. Your weight needs to be evenly balanced on both feet. When keepers are anticipating a shot to a side (like their right) they tend to load their weight on the opposite leg (left foot) to get full extension. That's fine if the shot is going to the right, but you're stuck if the ball goes to your left. Make sure you keep your shoulders over or between your feet. That will help keep your weight evenly distributed. A keeper must be able to get to high and low corners on drag flicks and that requires a more explosive, bigger stance. At the top levels you see keepers keeping their hands up and out to reduce the distance they need to react to make saves to the upper corners. This also adds the illusion of size. The width of your stance will also impact whether you can use your legs or hands to make a save on low flicks. The wider you are in your stance, the harder it's going to be to save low flicks with your legs. That typically results in the keeper diving with his hand on shots to the left. Because of the mechanics of the drag flick, it is a deceptive shot. A strike is fairly straightforward because the ball comes off the stick head. A drag flick starts on the stick shaft and the shot location will depend on the release point. It's a hard shot to read and keepers typically have problems because as soon as they see flick, they think aerial shot. Track the ball from the pushout to the stop and react to the shot. Focus on the ball, not the striker. The reality of corners is that when they are well executed they're lethal. Even when you know what the corner is and where the shot is going, there is a high success rate for scoring. Having said that, don't eliminate yourself by getting caught up in reacting to dummy hits and motion at the top of the circle. Successful penalty corner defense is a team effort. Your rusher has to be fearless and have the courage and confidence to limit or block the shot at the top. Your post player has got to be able to cover his area. You can't cover everything by yourself. The most realistic expectation is for you to save the saveable. As has been noted, the collar type and dangling throat protectors offer protection. In my experience I've found the acrylic ice hockey throat guards to be the most protective. Whether you wear a helmet and mask combination or a face mask, the throat guard ties to the bars of the wire cage on the helmet or mask. Because they tie at three points, they're not prone to flipping up when you dive like some of the dangling throat protectors. In addition, when it's properly fitted and secured the hockey throat protectors sit at the top of your chest protector. This prevents the throat guard from being driven back in to your throat when you're hit. Ice hockey throat guards do take a while to get used to. With the movement of the field hockey goalkeeper, how the protector is affixed and the contact between the acrylic and the metal cage there is some clanging/rattling. When you way that against the possibility of a crushed larynx and a tracheotomy, it's a small price. I play a lot of indoor and a fair bit of outdoor hockey and I've had three protectors break as a result of shots to my throat. At twenty US dollars a piece, I can rationalize their replacement. I don't want to imagine the cost of playing without one. Starting with reaction training, please check Rachel’s Tips on the OBO website. She has a good tip on REFLEX TRAINING. I do a lot of work with tennis balls in place of hockey balls in reaction drills but obviously that’s pretty tough on your own. I like to work on aerial saves with just a helmet, hand protectors and a stick and having someone hit tennis balls with a racquet. You can further add to the reaction element by facing your back to the hitter and turning on their call be fore the shot so you have to find the ball first. In regards to working on your own, one device that’s pretty cool is called a reaction ball and I believe it’s available through Just Hockey in Australia and specialty stores for strength and agility training. 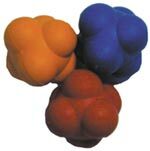 Reaction balls are rubber balls that have knobs so they’re not round and when you through them off a wall, they’ll take irregular bounces (hence the reaction part). You can work on reactions by throwing the ball off a wall and trying to catch it or keep it in front of you. If you have a training partner, try this drill. Stand five to seven meters from a wall facing it. Your partner stands behind you with the reaction ball. As you face the wall, they stand behind you and throw the ball. You have to catch or stop it. As far as reaction work for feet out of pads, I like to use a size three or smaller soccer ball and work on kicking off a wall. I’ll set up cones 1.5-2 meters apart and work on footwork by going around a cone in between kicks, i.e. make a kick, go around a cone, have to kick with appropriate foot, go around the other cone, kick, etc. Start ten meters away from the wall. By varying the distance you are away from the wall you can mix the emphasis between reaction and technique work. Even better, if you have access to a racquetball court or a corner with a two sided wall or a narrow hall way you can work off the different walls and focus on changing the angle of the ball.